Let’s start with Bali’s most iconic and most photographed temple, Pura Tanah Lot, a true landmark of Bali Island dating back to the 15th century. The temple sits on a rock, just offshore, surrounded by the Indian Ocean. It is said that this sea temple was built by Danghyang Nirartha, a Hindu priest who spread the Bali Hinduism over the island. The views from Tanah Lot and its surrounding ocean cliffs are just beautiful and especially during sunset time, the place has a magical atmosphere. Pura Tanah Lot is a popular tourist attraction so it can get quite crowded. Around the temple, there are lots of souvenir shops and warungs found. 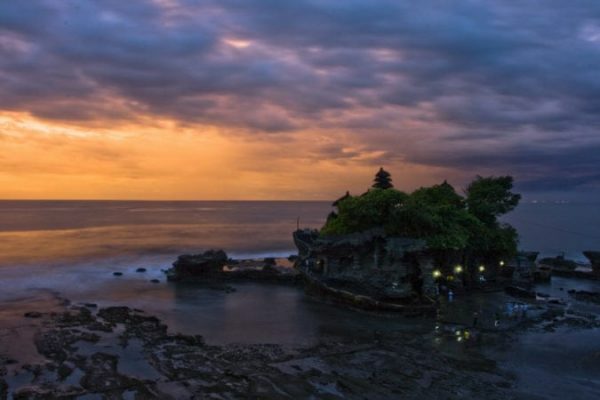 The saga goes that Pura Tanah Lot is protected from evil by the sea snakes that live in the caves beneath the temple. 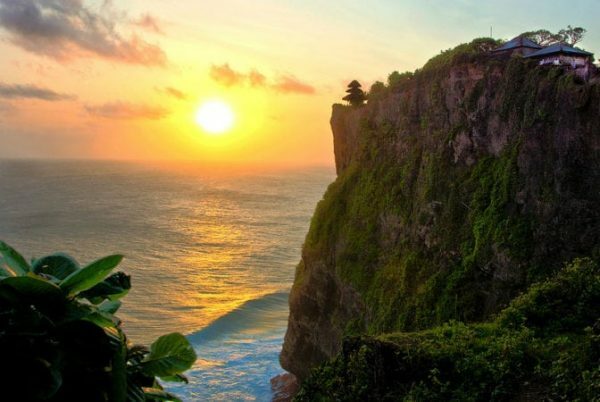 The Uluwatu temple sits proudly on top of a high limestone cliff, an impressive 70 meters above sea level. This temple dates back to the 10th century and it is said to protect the island from evil sea spirits. The view of the ocean and the mighty waves crashing on the rocks down below is just stunning! Around the area live lots of cheeky macaque monkeys on the look-out for food and precious items from unaware tourists. So, watch your belongings! They love to steal glasses, hats smartphones or anything they can grab basically and yes, they can also open bags. As the sun starts to set over the island, the views become even more jaw-droppingly beautiful and every night during sunset time, you can watch a traditional Kecak performance. 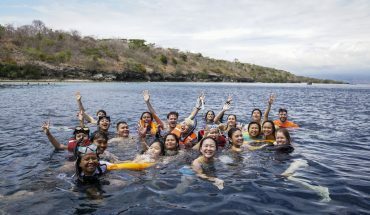 See our villas in Uluwatu here. 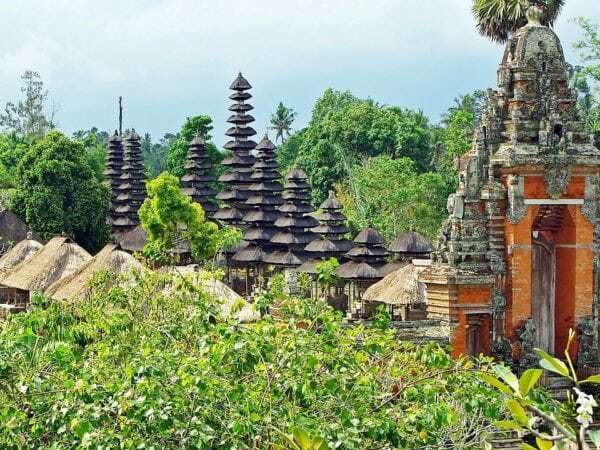 Located in Mengwi, just 17 km from Denpasar, this temple complex features beautiful traditional architecture with tiered-temple rooftops and sprawling royal gardens with lotus ponds and fountains. This garden water temple was built in 1634 by the ruler of the Mengwi Kingdom, I Gusti Agung Putu, and in those days it was only accessible for royalty. 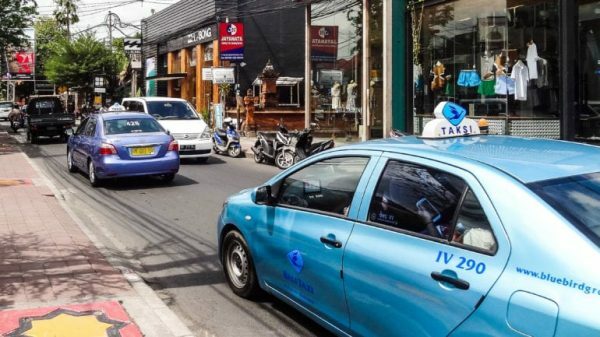 The ambience is idyllically peaceful and it makes a wonderful stop along the way from Denpasar to Ubud. The dramatic Balinese entrance is already impressive and behind it, awaits a true royal paradise for visitors to enjoy. Bring a picnic basket to enjoy this sacred place and it gardens ultimately! See villas near Pura Taman Ayun here. 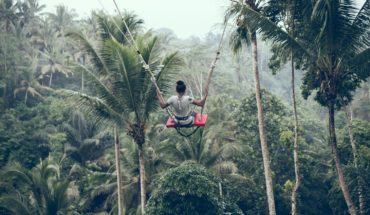 Located in Klungkung on the east side of Bali Island awaits a large temple complex centered around the entrance of a holy cave that houses hundreds of bats. 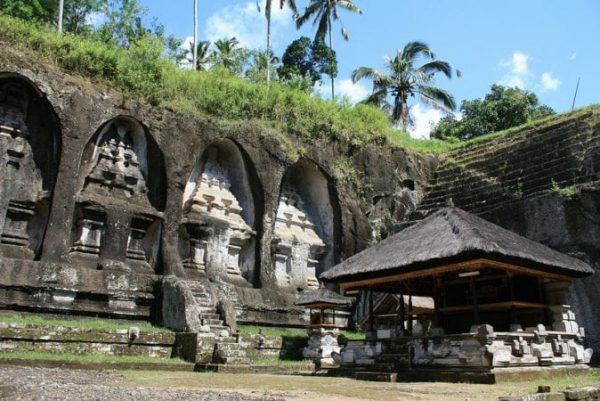 This temple, known as the ‘bat cave temple‘ was built in the 10th century and the saga tells that the prince of the Mengwi Kingdom hid inside the cave when facing enemies and he found an exit at the famous Besakih Temple located on the slopes of the holiest volcano in Bali; Mount Agung. The cave is only small but there are many ceremonies held there all year round. 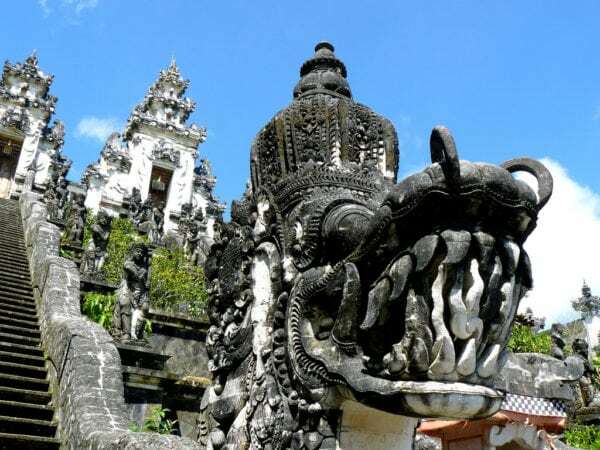 Within the temple complex, there are beautiful pagodas, shrines and Balinese stone-carved statues to be admired. A scenic pathway down to the sacred Pakerisan River leads to the ten ancient shrines of Gunung Kawi, carved into the face of a rock cliff. On the way down, the view of the surrounding rice paddies is absolutely gorgeous! The beautiful landscape is combined with a mystical atmosphere and an Indiana Jones-like setting. Gunung Kawi is also referred to as ‘the king’s graves’ as the 8-meter high rock-carvings are funeral monuments built by King Anak Wungsu to honour his father, the great ruler Udayana. Myths say that these temples were built overnight by the giant Kebo Iwa who possessed supernatural powers. Do note that the climb back up takes 270 steps and it is quite challenging for older people. The good news is that on the way up, there are shops and warungs to get drinks, snacks and take a rest before continuing the hike back up the valley. See villas near Gunung Kawi here. 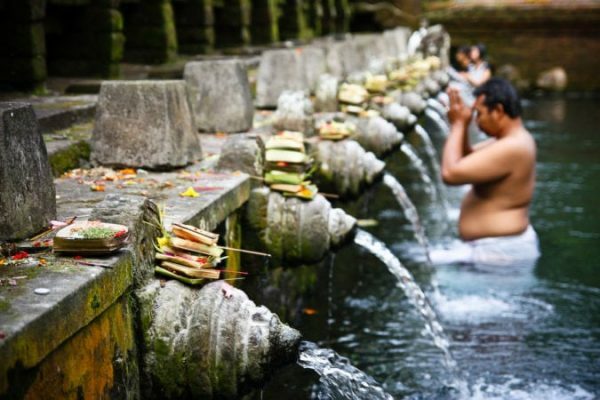 The sacred Pakrisan River flows from Gunung Kawi to the beautiful water temple complex Tirta Empul where you (yes also you as a foreign tourist) can do a ritual bathing. There are two holy natural spring pools located side by side with a total of 30 water fountains. The ritual bathing is meant for purification. You can bring your own sarong or hire one. Behind the natural spring pools, you will find the inner courtyard and the holy spring that feeds the purification pools. It is this courtyard where the Balinese come to pray. Tirta Empul was built in 926 AD and it is dedicated to the water god Vishnu. The complex also features a large fish pond where you can feed giant koi fish and enjoy a local nasi goreng if you are hungry. Located in the central highlands of Bali, where the air is cool and fresh and the nature untouched, awaits this beautiful lake temple. 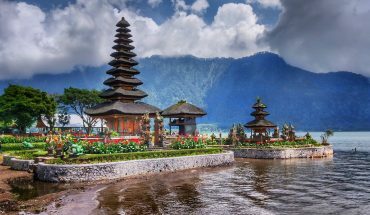 Ulun Danu Bratan is an iconic image of Bali Island, featuring tiered temples sitting on little islands on a large natural lake. This temple complex of 5 was built in the 17th century, honouring the main Hindu trinity Brahma-Vishnu-Shiva and the lake goddess Dewi Danu. 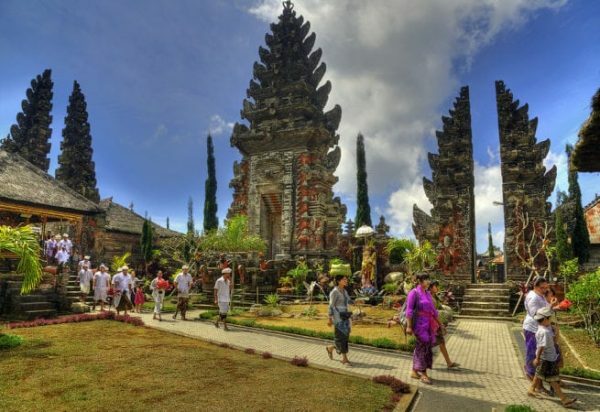 The temple complex is embedded in sprawling gardens, traditional Balinese pavilions, and stone-carved statues. Uluna Danu Bratan is a big tourist attraction and it can get crowded. You can escape the mass by renting a paddle boat and drift out on the lake. It is a wonderful place to visit! This is the biggest and holiest temple on the island and a big tourist attraction. This enchanting ‘mother temple’ of Bali towers up 1,000 meters high into the sky on the slopes of Mount Agung, the most sacred volcano of Bali. There are 86 temples to be admired in total at this complex of temples and the view of Mount Agung and the surrounding rice paddies is mind-blowing! 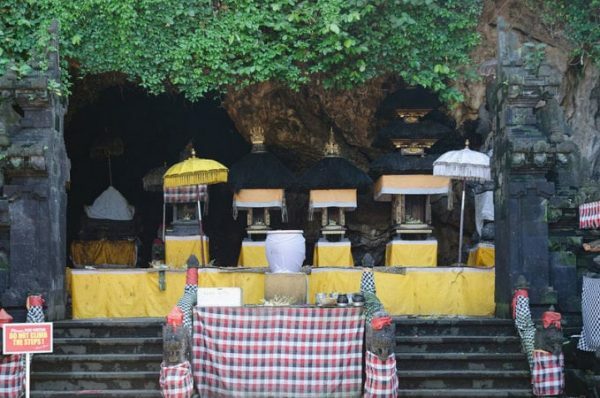 The Besakih temple was built 1000 AD, dedicated to the dragon God Besakih who is said to live inside the sacred mountain. Besakih is the only temple where a Hindu of any cast may worship. There are many temples and courtyards in this sacred complex, but most are reserved for worshipping. Visitors can admire the temples from the outside. You can get a local guide to show you around but you can also walk around by yourself. Ulun Danu Batur is the second most important temple on Bali Island, located in the Kintamani highlands by Lake Batur. 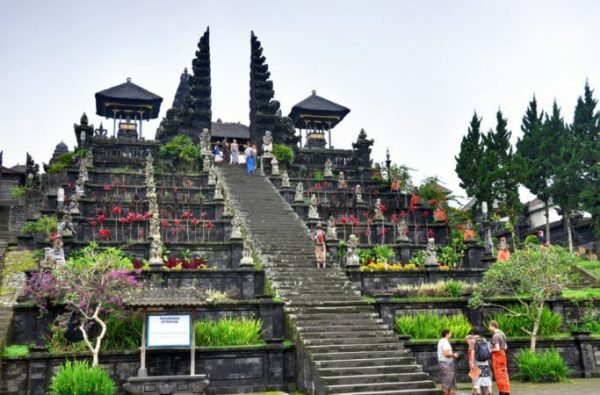 The temple was originally located in the caldera on the foot of Mount Batur but after an eruption in 1926, the most important shrine, which was the only one not destroyed by the lava. It was moved away from the crater lake to where it is today and Batur village was rebuilt around it. This temple complex is dedicated to the goddess of lakes and rivers Dewi Danu and there are 9 different temples plus a total of 285 shrines to admire, set amongst sprawling gardens by the lake. The view of Lake Batur and the surrounding volcanoes Mount Batur, Mount Abang and Mount are just magnificent. Bring your own sarong to this temple if you don’t want to pay the head price. This gorgeous temple is one of the oldest in Bali and it is located 1,175m above sea level on the peak of Mount Lempuyang in East Bali. To get to the temple, you will need to climb a long staircase of 1,700 steps in total. It’s a bit of a hike, taking around 1.5 to 2 hours, but on the way up, you get to see other temples and wonderful views of the surroundings. The view at the top beats it all, overlooking the lush green forests, the Besakih temple, and the sacred Mount Agung. The climb is a spiritual journey for the locals and complaining is not appreciated. The temple is never crowded and at the top, you can really feel the magical ambience of this sacred place. If you enjoy a good hike, don’t miss out on this one!